Are You Ready for Storytime? 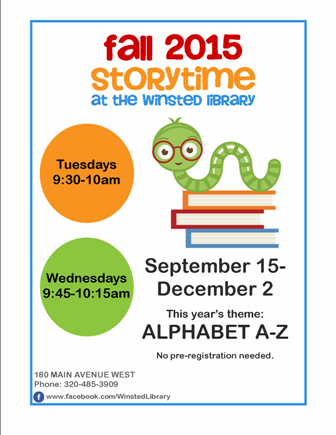 Come join us this fall on either Tuesdays from 9:30-10am, or Wednesdays from 9:45-10:15am to enjoy some Storytime fun! During this 12 week session, we’re going to learn about the Alphabet from A to Z. There will be lots of stories, dancing, singing, and hands-on art and science activities for all ages to enjoy! No pre-registration is needed, but if you’d like more information, please contact the Winsted Library by calling 320-485-3909, or emailing winsted.staff@pioneerland.lib.mn.us . 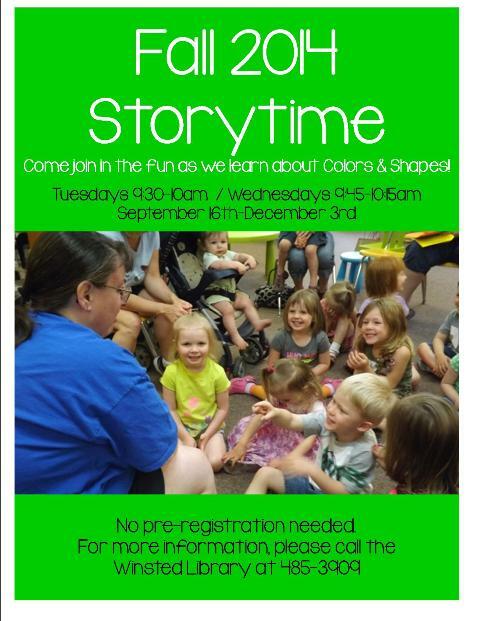 Fall 2014 Storytime is almost here! Are you ready to do loud? Are you ready to do fun? Are you ready to do AWESOME? We are! Fall Storytime is starting ONE week from today, on Tuesday, September 16th at 9:30 am/Wednesday, September 17th at 9:45am! We’ll be learning about colors and shapes while we read stories, sing songs, dance like pros, and do take-home crafts. All ages are welcome, and no pre-registration is needed!